Beautiful private beach just steps away! Reserve any week in June, 2019 by May 31,2019 and receive $200 off the weekly rate! A rustic, family summer cottage situated on Cape Cod Bay at the end of a private, tree lined lane in Brewster. It is situated on 1 1/2 acres of waterfront property with a 150 ft private beach just steps from the back porch door. Built in 1936, this cottage has 2 large bedrooms and a 1/2 bath upstairs. Downstairs, there is another large bedroom and a private study/additional small bedroom. Also, on the main floor, there is a spacious living room with a fireplace & dining area; a kitchen; a full bathroom and a charming, fully screened-in porch with beach/ocean views (perfect for watching birds & sunsets). A large attached garage holds beach toys, water floats, a canoe and recreational & clamming equipment. There is also a washing machine (we will be adding a dryer for the 2019 summer season) and large set tubs (to hand wash delicates, small children, clams & seashells) in the garage, for occupants' convenience. A clothesline for air drying clothes hangs outside, next to the outdoor shower. This is a quiet, private setting where you can hear the water lapping at the shore from your bedroom or the porch. This cottage has been passed down, and will be under the 4th generation, new ownership for the 2019 summer season. We will be upgrading the cottage, and adding new amenities like WiFi internet, cable TV and a DVD player for rainy day/evening entertainment. Additional pricing info: Off Season Daily Rate: $350 per night (w/TWO Night Minimum) - Off Season 3 Night Special for $1000, State and local taxes of 14.45% will apply. Wheelchair access through the garage with one step up into enter house. First floor bedrooms and full bath. A wonderful getaway where the whole family can experience the charm of an old time vacation with the surf and the sand to ease your mind and soothe your soul. This charming cottage is wonderfully unique and supplied an experience you're unable to get in a typical rental. Definitely for the family looking to unplug and enjoy the bay without the interruptions of modern life. My favorite place I've ever rented. 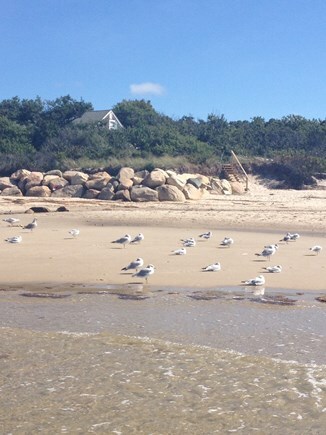 There aren't many places like this left on the Cape where you can completely escape. 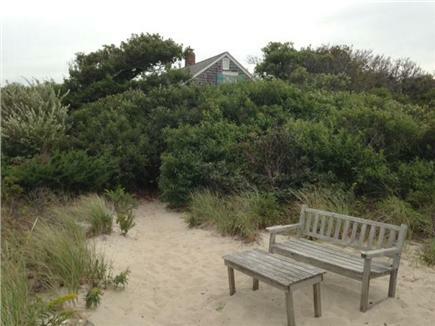 The beachfront and grounds are completely unspoiled. Yet all the amenities of Brewster can be accessed only a short distance away, including the bike path. It's also the most beautiful place to watch the sunset on Brewster Bay. I have stayed here with my family for three years running now, and I can't say enough. Words that come to mind are location (amazing) rustic charm, sunsets. 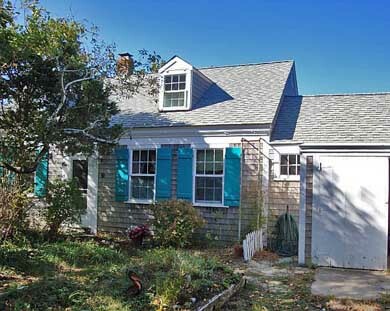 This is truly a Cape Cod cottage -- very private and very nice owners. You can't get any closer to the beach than this!! A lovely, quiet, beachfront cottage with warm summer breezes and cool shade was how we spent 2 gorgeous weeks here. Very safe for our 4 year old son with lots of beach life to explore. Stars overhead at night, close to stores, restaurants, and ice cream. Originally, my great grandparents, and then my grandparents and great aunt, used this cottage as a private family retreat. When my mother, Barb and her cousin, Chuck, took ownership, my mom began renting our family cottage to share this private, secluded hidden gem of a vacation spot with others. My parents both passed away earlier this year (3 1/2 weeks apart), so i am now the fourth generation to own the cottage (along with Chuck & my sister, Emily)., and we cherish it as much as our great grandfather did when he built it. We, plan to make several upgrades and improvements, and add new amenities this year, in an effort to enhance the renters’ experience. We hope you love it as much as we do! My great grandfather built this cottage, himself, as a Valentine’s Day present to his wife. 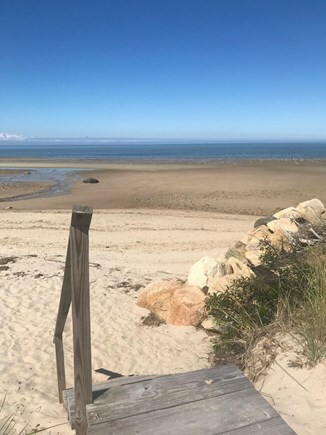 Every generation in our family since then, has each fallen in love with the breathtakingly perfect location right on the water’s edge of Cape Cod Bay. My grandparents spent their entire summers at the cottage. My parents would bring us to visit them for two weeks every year. This cottage is rich with family history, tradition & nostalgia. One tradition, clamming out on the flats at low tide, began before dawn. My great grandfather, grandmother and mother, all claimed to be able to “feel” clams just by walking barefoot over the sand...and they would always be right when they told me, “Dig here! Fast!” This adventure would lead to making & eating clam chowder for dinner from our successful foraging, followed by roasting marshmallows for s’mores in the fireplace while catching glimpses of the bright red & orange sunsets falling over the rising tide, through the living room windows. We would spend the long, hot summer days building sandcastles on the beach and “hermit crab hotels” in the tidal pools. We would always make new friends on the beach with kids who were staying at the other cottages on the lane. We never had a television in the cottage back then, but we never missed it because we were too busy catching fireflies or night swimming! We hope your family will start your own memorable traditions at our cottage!! Brewster is a quaint little town, located close enough to the bigger, more bustling Towns of Orleans & Harwich. The cottage itself has everything you need for a perfect summer vacation, so you never have to leave once you arrive (as long as you bring enough food for your stay)! It is located on the Bay, for warmer and calmer swimming & canoeing conditions. Your own private, sandy beach is just steps from the porch. Low tide gives you opportunities for collecting shells, clamming, building sandcastlees, playing games like whiffle ball, sunbathing, jogging or long walks at sunset. There are great restaurants, small boutiques & ice cream shops within walking or biking distance (bicycles can be rented at Nickerson State Park). Wellfleet’s flea market & drive in movie theater are only a short drive away. Plenty of non-beach entertainment & rainy day activities are close by.